Today is “hump day” of the week-long AGU fall conference. The day started bright and early in the morning (all of the days actually start bright and early, with the first talks beginning at 8AM), when I attended the Water Pop Up session. 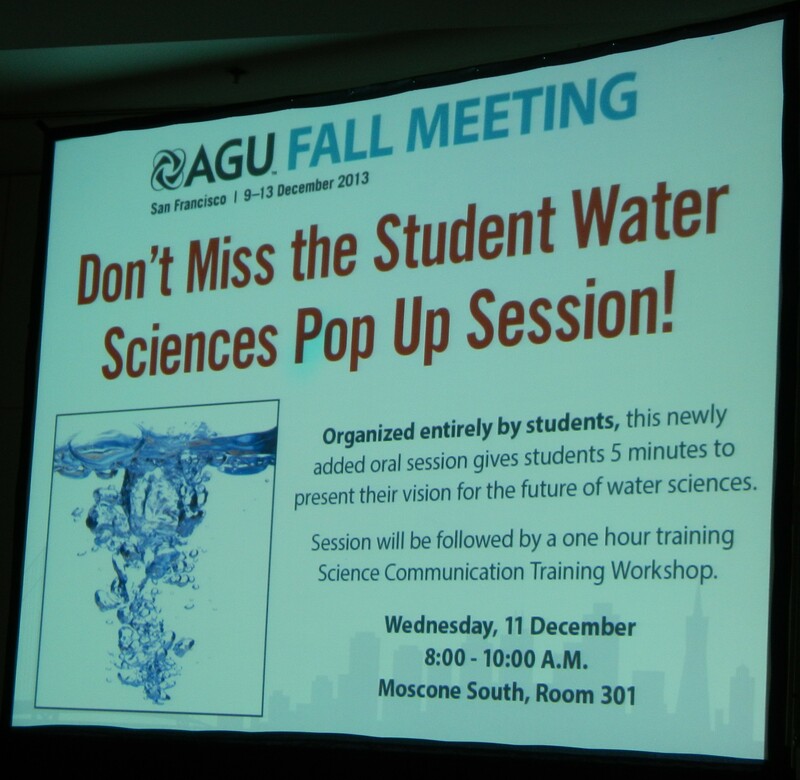 This format of session was a first for AGU. In this session, organized by graduate students, each student had only 5 minutes to speak. Now that may seem like a really long time, but it is very short when you think of trying to include your data and message. My former undergraduate researcher Abbey Dufoe, now graduate student at the University of Montana for environmental studies and natural resources journalism, was one of the speakers. I was so proud to see her give her first oral presentation at a conference! All of the students did very well, and I liked the variety of talks that this format allowed. After going through the posters in the session on Social Media for Science: Challenges, Opportunities, and Maximizing Impact, I swung by two special posters in the poster hall this morning – the ones being presented by my husband and my sister-in-law (see my post on It’s a Family Thing). I then headed to the lunchtime Union Frontiers of Geophysics lecture by Dr. James Hansen. His talk went through climate impacts, such as ice sheet disintegration/rising sea level, species extermination, and climate extremes. I spent the afternoon going through the Exhibit Hall, looking at everything from books to equipment to outreach materials. It was a full day, that will begin all over again tomorrow… starting at 8AM, setting up my poster for my afternoon presentation!